-Roughly 30% of the world’s electricity comes from natural gas and petroleum. -The oil & gas industry is a huge player in world-wide energy. Nearly all sources of electricity derive from turbine-driven generators which are run by either wind, water, or the burning of a fossil fuel. -The three largest single sources of electricity in the world are: coal, natural gas, and nuclear fission. We often associate petroleum (oil) with gasoline, but only about 70% of all petroleum is used for gasoline, jet fuel, and heating oil. All plastics come from petroleum. Think about that for a second. That means your computer, the dashboard in your car, the hangers in your closet (oh, and synthetic clothing fabrics are made from petroleum too), toys, appliances…the list goes on and on. Not only that but things like asphalt, rubber, perfumes, and even aspirin have petroleum in them! There are over 6,000 uses for petroleum other than fuel. The oil & gas industry is thought to be the biggest industry in the world in terms of capital value. 1) The total length of natural gas pipelines in the U.S. could reach to the Moon and back 7 times. 2) By weight, there is more oil at any given time being transported on the oceans than there are fish by weight in all the oceans. 3) Oil is BIG. How big? For the sake of this point let’s set out some base information: 1 terawatt of power = 1,000 gigawatts. 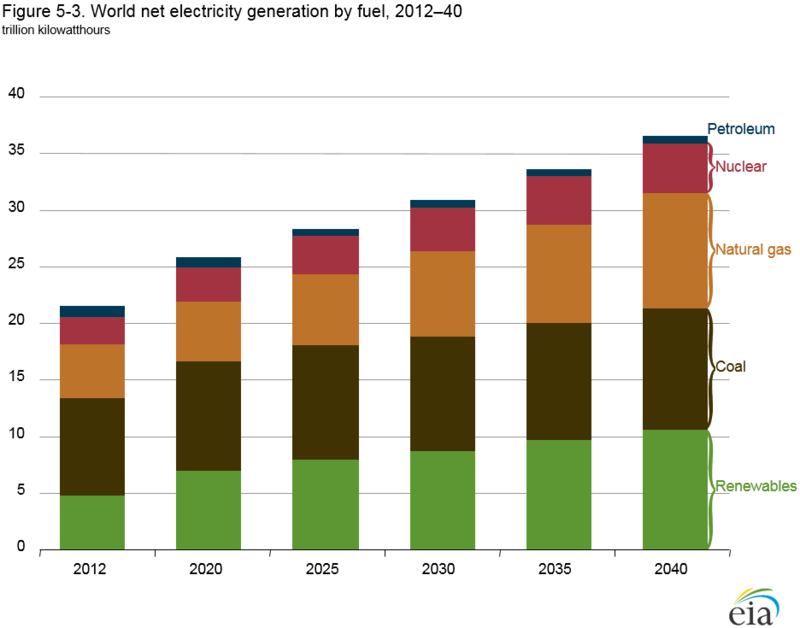 In 2010, oil produced roughly 5.7 terawatts of power worldwide. Wind power in 2010 generated around 34 gigawatts, or about half of one percent of oil. Solar is even worse having produced 3.4 gigawatts which is 5/100 of one percent. To put another way: if solar power production doubled every decade for 100 years, it would still be way behind oil. Keep in mind this is not even including natural gas, which would render these proportions even more ridiculous. When we talk about the industry itself, it is divided into 3 basic sectors. The first area is called Upstream. This refers to the exploration and production efforts. Upstream is also sometimes called E&P. As you might imagine, this is all about finding underwater or underground sources of oil and gas and extracting them. Included in this sector are sub-sectors such as well exploration and research, rig operations (onshore and offshore) and machinery rental or acquisition. When you think of “Big Oil”, most of those corporations are represented in the Upstream sector (think: ExxonMobil). Midstream is the area that logically connects Upstream and Downstream. This would mostly be about the transportation and storage of oil and gas. This is accomplished through pipeline infrastructure and of course oil tankers and other transport vehicles. Firms that represent this sector are not as publicly visible or commercially known. One of the largest firms in the world in this sector is Kinder Morgan. The Downstream sector is all about turning the crude oil (or gas) into a usable product and then marketing it for retail use. A lot of the Downstream companies are very familiar to us: Marathon, Phillips 66, and Sunoco are prime examples. U.S. leads the world in production. An oil boom began in 2010 despite a shift toward “green” technologies. Improved pipeline infrastructure and innovations in the oil drilling industry have fueled this resurgence. According to the U.S. Energy Information Administration, the United States has been the world leader since 2012 and this is projected to continue. What other countries produce oil? Here are the top 10 oil producing countries in the world. In short, no. At least not when it comes to the energy needs of the industrialized world. The fact remains that the three most popular sources of “renewable” energy (Solar, Wind, Hydro) are wildly inefficient on a cost-benefit ratio. When the sun doesn’t shine or when the wind doesn’t blow, fossil fuels are needed as a backup at an almost 1:1 ratio. That means that for nearly every megawatt of renewable energy produced, the grid needs a megawatt of reserve energy from oil or gas to back it up. A small fraction of the energy consumed in the U.S. and abroad is provided by wind and solar technologies. Below is a recent graphic from the EIA which illustrates prior and projected sources of energy consumption for the United States. Oil & Gas consumption has only just begun. It may be difficult to imagine for someone in the U.S. or western Europe, places where wealth and technology have resided in such consolidation for a century, that about 80% of the world has just begun to consume oil and natural gas to fuel their automobiles and their burgeoning skylines. Consider this: America consumes 25 times more petroleum than India, and India has four times more people. The demand, and in fact need, for oil and natural gas will only increase despite the renewable craze in the wealthiest nations.